Moar Adventrz of da Otterz Mob - Ramblings of Mad Shutterbug & the Border Collie Bros. The event? Fred-Con. That's the name we gave it, the group of us who in some cases knew each other face-face, in others knew each other via Blogspace, and all of us knew Skippy & Fat Fred Otterz. Someone suggested we ought to get together. Someone else said sure, where? And... Lost Wages, Nevada got mentioned. What happens in Lost Wages, mostly stays there. Mostly. This is during brunch (bit late to be like Breakfast, really, too early to be Lunch) our first morning there. 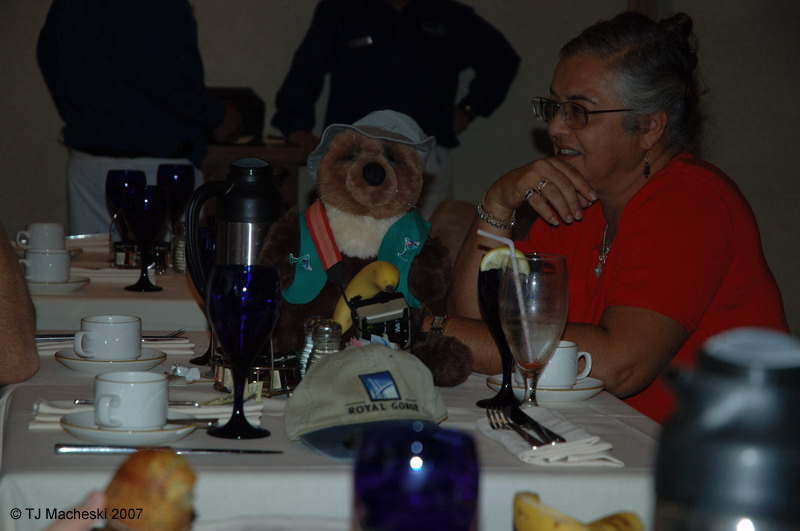 Otterz and Humanz getting together for a meal, getting to know each other face-face. Even the waiter got into it with us. Grand time. Posting Pic'o'Day now because this evening I will be at Hospital. Morning chores on teh Ranch are done. Laid in more feed (the never-ending story), replaced a couple of the old feed barrels due to age and cracks in either the plastic barrels or the lids. Yes, I said plastic. The kind used to import olives and peppers from Greece, big barrels, they hold 250 pounds/ 113.6 kg of feed and are weather-proof. Those barrels/lids being replaced are on the order of 8 - 10 years old, and they live outdoors here in North Central Baja Jorja through the heat and sun of summer and the freezing of winter. OK, so our freezing isn't usually as low nor as long as say South Dakota. It does freeze here. Froze here quite a bit, for the geography, this past winter. Those cracked barrels (and a few lids) are no longer weather proof. The plastic however is still useful for other things, and likely to show up in other projects as a result. Once it's totally worn out, then we recycle it. Best we can do given circumstances. Also filled Forrest NissanPickup with petrol, plus a bit for Herself's yard tractor which gets a lot of use around here. Harrison Ford8N Tractor also gets a workout, but he's a bit much weight for mowing over the septic tanks or drain fields, eh? Plus, with moving the adolescent doelings last weekend (and continuing to move them into their new digs) their old spot, out in front of Studio 318 needs to be tilled and planted as a garden. Will get some other photography work done today before Hospital work. Tomorrow weather permitting, experimental under-water photography in a friend's pool. That will be on film, so delayed gratification for all of us.